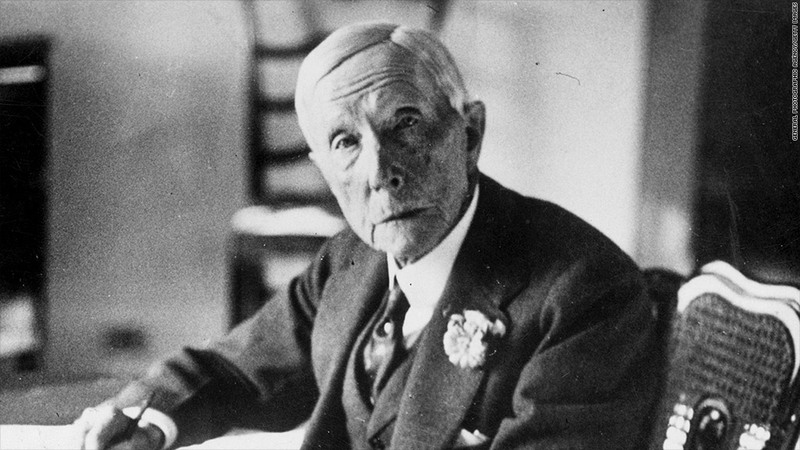 Rockefeller made his fortune by revolutionizing the oil industry. Before his time, lamp oil was unpredictable. But he figured out a way to standardize the quality, and Standard Oil was born. Rockefeller's shrewd business sense led to the rise of one of the biggest companies in the world. By 1880, Standard controlled 90% of the oil produced in the United States. The government broke it up in 1911 amid allegations of price fixing and other underhanded business dealings, but not before Rockefeller became the country's first billionaire. He spent the last part of his life giving away much of his fortune, including money to found the University of Chicago and the Rockefeller Foundation. The companies that sprung from Standard Oil's breakup -- including ExxonMobil (XOM), Chevron (CVX), ConocoPhillips (COP) and a big chunk of what are now BP's (BP) U.S. operations -- remain among the world's largest. Source: *Most nominal wealth estimates are from The Wealthy 100 by Michael Klepper and Robert Gunther, and include wealth at time of death, including bequests. Estimates were then calculated as a fraction of the overall economy at time of death by Sam Williamson of Measuring Worth, and then presented in 2013 dollars based on the size of the current U.S. economy. Estimates for Gates and Buffett provided by Wealth-X. Biographical information from The Wealthy 100 by Michael Klepper and Robert Gunther, Encyclopedia Britannica, and The Prize by Daniel Yergin.